Anna-Leigh and Paul’s celebration at Domaine Du Beyssac was everything we love about French weddings, and so much more! The couple focused on creating the most joyful day with all their loved ones, and the results were nothing short of stunning. With the help of Awardweddings, they hung ribbons in the “happy” ceremony tree, used wildflowers arranged by Les Ideales for the tables and bouquets, and dressed up the historic site with colorful lanterns. The vibe was casual, summer chic, and Susie Kelly Photography captured it so all beautifully. From the raw emotions to the unbelievable sunset over the French countryside, everything about this destination wedding was truly unforgettable! As it was a destination wedding, it was so important that we made it easy for our guests to get to our venue. They were already making the journey to France from Ireland and some of our friends and family even came from Vancouver and New York. So we made a website with a list of hotels in Toulouse city as our venue was 50 minutes outside the city and then had a coach collect all our guests the day of the wedding and bring them to the venue and bring them all home that night. Getting a sneak peek out the window of the coach pulling up and all our loved ones there that day was such an amazing feeling. The whole day was so memorable, but I think for me walking down the aisle with my dad and seeing all our friends and family there and Paul waiting for me was just so amazing. I remember stepping out of the house and into the garden and I started to cry, happy tears of course. The tears really took me by surprise as I had been so calm all day but it was just such a special moment and it was perfect. Luckily my amazing photographer had hidden a tissue in my bouquet in case of emergencies! My mother and brother wrote our ceremony and tailored it to the story of our lives together. My brother delivered the ceremony and we had our family members do some readings and poems. It was incredibly special and emotional with some funny stories thrown in for good measure. It really set the tone for the whole day and everybody commented on the ceremony and how unique and beautiful it was. We wanted our wedding to be relaxed, fun, colorful and full of happiness as there would never be another time we would have our family and friends in one place like this on a holiday. We wanted to include as many colors as we could in our wedding with the flowers, lanterns, table settings and the ribbons we hung from a tree which became known as the happy tree. For anyone planning their wedding, I would say please don’t stress the small stuff, the little details that seem so important at the time that nobody will notice on the day. Everyone is just so happy to be there with you. Remember this is both your special day so you do what you both want to do and it doesn’t matter what anyone else thinks. The day will be perfect no matter what as all your friends and family will be there to celebrate your love for each other. Congratulations to Anna-Leigh and Paul, and a big thanks to Susie Kelly Photography for sharing this beautiful Domaine Du Beyssac wedding with Junebug! Want to see more gorgeous French wedding inspiration? A flower child and a skateboarder tied the knot in this French wedding at Chateau de Zuthove! Selecting a diamond can be challenging, especially with so many factors to consider. From color and carat to size and price, narrowing down what’s most important to you is only the first step in finding The One! With so many options to choose from, RockHer is making it easier than ever to find the best diamond for your budget using technology you thought only existed in the future. In addition to ROSI’s ability to search across the globe for the best diamond for your budget, you can shop diamond engagement rings curated by ROSI directly from RockHer. Besides hosting the amazing technology of ROSI, RockHer.com is also an online wholesaler that carries all possible diamond sizes, cuts, styles, and more, specializing in selling luxury engagement rings and fine jewelry. The diamond of your dreams should take your budget into account and thanks to ROSI you can browse the highest quality diamonds at your price point to find the specifications and ring that meet your needs. Shopping custom made RockHer engagement rings is as easy as selecting a setting, diamond, and ring size. Start with a setting, like asscher cut engagement rings, classic emerald cut diamond engagement rings, or white gold princess cut engagement rings. Next, browse RockHer’s incredible variety of diamonds, like ethically sourced conflict-free diamonds selected by diamond search engine ROSI or RockHer exclusive Cushion Brilliant diamonds featuring hearts and arrows facet patterns. Looking for something boldly different? RockHer also specializes in gorgeous sapphires that stand out in a number of settings. Learn more about each of these brilliant settings below as you begin to create the perfect engagement ring for you! For next level sparkle, consider RockHer asscher cut engagement rings, which capture more light from all angles due to their wider corners. Asscher cut diamonds are designed to shine with maximum brilliance created by additional rows of facets to the bottom of the stone that maintains the classic look of the diamond while appearing more dynamic than ever. The distinct square pattern makes this standout cut an extraordinary choice for your diamond engagement ring. Classic emerald cut diamond engagement rings are popular for a reason: not only does the emerald cut diamond have increased clarity than your average diamond engagement ring, it also has 5% greater surface area. When compared to another cut of the same carat, the top surface of an emerald cut diamond will look larger. This elegant cut sparkles brilliantly due to its flashes of white light that contrast the dark planes throughout the stone. Princess cut engagement rings are revered for their chic square shape, which stuns in a variety of settings. This versatile stone adds a modern touch to antique-looking engagement ring styles while also being the perfect vintage flair in an elegant modern setting. When compared to a round diamond of the same weight, RockHer’s princess cut will appear larger. This means that even at a smaller carat, the diamond will pack the same punch as a greater carat in another cut at a fraction of the price, making it a top choice for the best diamond for your budget. We’re especially obsessed with white gold princess cut engagement rings, which are eye-catching and elegant no matter in a solitaire or three-stone setting. Exclusive to RockHer, Cushion Brilliant diamonds blend the antique-looking charm of a cushion shape with the modern ideal-cut round diamond. The Cushion Brilliant diamonds feature hearts and arrows patterns with incredible precision that is notably brighter and whiter than standard cushion cut diamonds. Because fancy shapes are priced lower per carat, The RockHer Brilliant Cushion also offers more breathtaking beauty for your budget than a hearts and arrows Round Brilliant Diamond. Looking for something beautifully unique that’s just as timeless as a diamond with a little something extra? Popular diamond alternatives are gorgeous sapphires in white gold settings. A sapphire engagement ring is ideal for bold brides-to-be with an affinity for vintage styling calling back to the ’20s when the blue-colored gemstone rose in popularity. Ready to find the best diamond for your budget with ROSI and shop the engagement rings of your dreams on RockHer? Don’t miss the Spring Sale to save 20% off all engagement ring settings now! 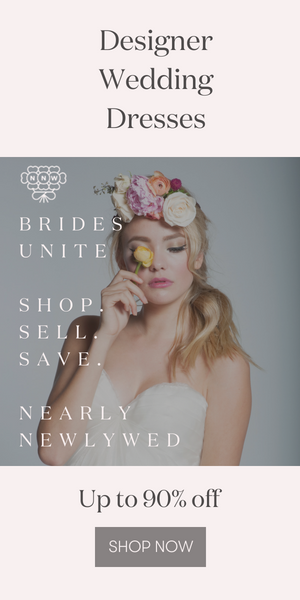 We’ve also partnered with RockHer to provide you even bigger savings with an additional 10% off the sale using code JUNEBUGWEDDINGS, making your total savings 30% off ring engagement ring settings! *This post is sponsored by RockHer! Krystin and Jonathan’s unique Appalachian Trail wedding was truly a sight to behold! Not only did the couple hike up a mountain to get to their ceremony location, but they set up a glamping-style reception at Krystin’s parents’ home for an unforgettable gathering with loved ones. Soirees + Revelry used all the bohemian-inspired decor you could ever want for the reception, including teepees, mismatched glassware, rugs, lounge areas, pillows, and the prettiest natural greenery. And the couple added DIY touches that made the event feel even more personal and heartfelt. We’re whole-heartedly obsessed with every detail of this outdoorsy wedding, and are so grateful Corey Lynn Tucker Photography was there to capture it all! We decided to get married on top of “the mountain” which is along the Appalachian Trail in Pennsylvania, a place of deep meaning to both of us. The hike was not easy especially in a wedding dress, but it was so worth the adventure. The mountain was very foggy as we started our ascents separately but seemed to break just as I walked towards Jonathan to be married. It was beautiful and almost magical. And then we hiked down holding up my dress and veil together as husband & wife. We wanted a place that would be able to house the tents we had everyone stay in overnight, plus also would allow the party to never end. We had a bonfire, and bands, and no curfew… so a field at Krystin‘s parents’ house was the perfect solution. It helped that the location was epically beautiful! We tried to do as much as we could ourselves. I am an artist, Jonathan is a carpenter so we are both very creative and good with our hands. The table assignments were little garden signs within planter boxes, that corresponded to an herb on everyone’s place setting. The favors were flashlights with engraved leather straps. Everyone had their own unique antique colored glasses for the evening, that we acquired by going to estate and yard sales for over a year, which was a fun way to get the whole family involved. We built tables and wrote out signs. We built a canvas together that everyone signed/drew on which we will create an art piece out of for our home. The more we were able to put ourselves into the wedding, the more it felt like it was for us. Floral Design – KLW Floral Design Co.
Congratulations, Krystin and Jonathan, on the beginning of your forever and thank you for sharing your special Appalachian Trail wedding with us! Love these outdoorsy vibes? Get inspired by this gorgeous outdoorsy indoor wedding at Coppes Commons!